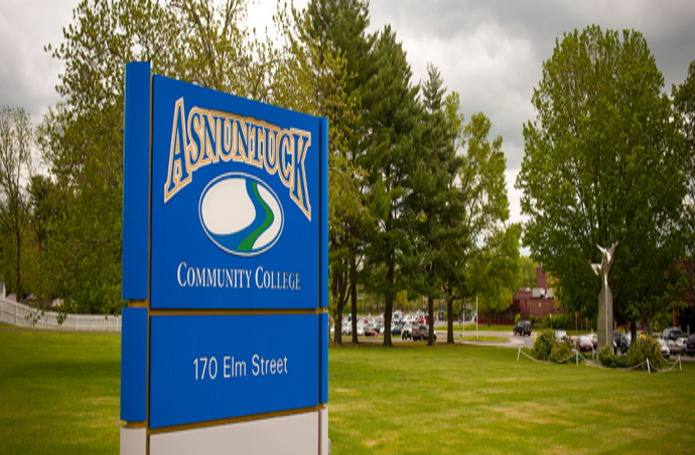 This project scope entails a complete new roof replacement of Asnuntuck Community College building consisting of approximately 170,000 gross square feet. In addition this project includes construction of a new two story building entry of approximately 14,000 gross square feet to the existing building. This new construction provides a new main entrance building addition facing Elm Street work consists of an addition of approximately 3,500 square feet. This two story new entrance addition will incorporate new first and second floor building spaces and reconstruction with renovation of approximately 10,000 square feet. These spaces include, entrance lobby, student lounge and student committee areas, student informal gather space, conference area, bookstore, café food service, café seating, women and men accessible rest rooms with janitorial support areas, an accessible meeting room, and associated adjacent corridor circulation areas. Adjacent existing first and second floor building areas are being renovated to coordinate with the new front entrance and new student areas. Existing building renovation project scope addresses, architectural, structural, mechanical (heating, ventilation and air-conditioning), electrical, plumbing, fire suppression, fire alarm system work complying with the current enforceable State building and life safety codes. An additional project for the College included an expansion of the existing Advanced Manufacturing Technology Center. A 3,000 SF one story addition included reworking of existing spaces, MEP upgrades, equipment installation and the addition of a 24 station welding shop. These projects included pre-construction and construction administrative services as part of an on call services contract.